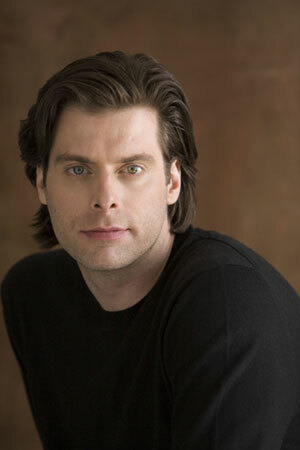 Today we speak with bass John Relyea, who made his role debut as Don Quixote on opening night last Saturday. Relyea was last seen in Seattle as Bluebeard in the 2009 production of Bluebeard's Castle, where he once again performed opposite Malgorzata Walewska, the opening night Dulcinea in Don Quixote. We caught up with the Seattle Opera favorite and asked him what it's like to play such polar opposite characters, and what got him interested in this opera in the first place. Your performances in Seattle have been title characters in very offbeat operas (Bluebeard’s Castle, Don Quichotte, and then Attila next season). How rare is it for a bass to get to play so many main characters as you have? While there are a good deal of main and title character bass roles, the ones I have had the opportunity to perform in Seattle are much less frequently performed—sometimes for casting reasons. Often it is hard to find the right singers for the roles. Other times, the operas have just never moved into popularity. I find it somewhat puzzling as to why Don Quichotte isn't performed more often. The music is so beautiful, and the story is fantastic. You also play a lot of bad guys. What’s that like? Do you ever want to be the good guy or have a happy ending? Quixote is the protagonist here, but his end isn’t so bright and cheery…. I think after spending so much of my career performing the role of Figaro, who is such a likable guy, I felt the need for a real change. The last few years have found me going deeper into the bad-guy repertoire. I don't really know why, but I feel very alive on stage as a villain. It's lots of fun. But Don Quichotte is a truly good human being to the core, whose delusion has spawned largely from a desperate need to make a brighter, kinder, more peaceful world. Although the ending is sad, the overall statement he makes is a very positive and warm one. John Relyea (Don Quixote), with Eduardo Chama (Sancho Panza) standing behind him. Have you ever noticed if people treat you differently offstage because of the dark characters you portray onstage? Does anyone ever think you’re meaner than you are? No, I go out of my way to be a kind, supportive colleague. But I tend to do "Bad" well, which can leave some wondering if there's another side they're not seeing! You started out in rock bands when you were younger, so it’s probably fair to say your musical background is diverse. But what about today – do you still play, sing, or listen to rock music? I still travel with my guitar, and play around with rock and roll. Seattle is such an important city to me from that standpoint. Jimi Hendrix was born here, and so was grunge music--two of my favorite things! I LOVE the Experience Music Project! My iPod has just about every type of music on it - from jazz to…well…some very loud music! 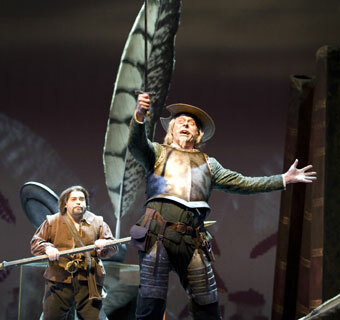 Eduardo Chama (Sancho Panza) and John Relyea (Don Quixote). This is your role debut as Don Quichotte. How did you first discover this opera and what made you want to undertake this new role? When I was much younger, and beginning as a singer, I once saw Chaliapin portray the knight errant in the Don Quichotte film made in the early 1900's. His acting and singing were legendary, and the story moved me greatly. It left a very strong impression on me. So when Speight offered me the role two years ago, I jumped at the chance. 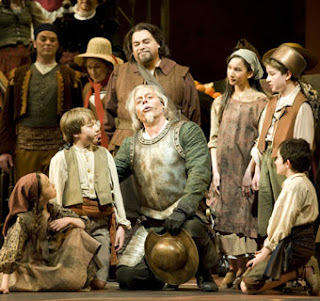 In your preparation for Don Quichotte, have you tried to reconcile the way the character is portrayed in the novel with how he’s seen in the opera? For example, the novel seems to make him out as more of a fool, while the opera is more sympathetic. The novel is filled with Quixote's many misadventures, which inevitably boosts the element of comedy in the story. But I believe that in choosing the windmill scene as the main comedic scene of the opera, one easily sees how reckless and funny his insanity makes him. But throughout the other scenes, the opera rightly shows us there are other sides of Don Quichotte, which make him so balanced as a dramatic figure—the sympathetic, righteous, romantic, selfless, and noble traits. About the Don's sanity, I love the quote from Cervantes that is projected on the scrim before the very last scene in this SUPERB production (NOT verbatim, but to the effect that) if sanity is seeing things as they are, then isn't it better to see things as they ought to be? Amen!! !